What the 2012 Corolla lacks in substantial changes to its beige exterior and likely uninspired driving experience, it attempts to make up for with a new emphasis on la dolce vita. The most interesting line found in the sea of beige that is today's press release announcing the 2012 Toyota Corolla is that the Corolla's design was "created with input from styling studios in Turin, Italy." Yes: This year, in addition to notifying potential purchasers about keyless entry for the base model and an upgraded stereo head, Toyota wants you to know about the Corolla's innate Italian character. Your high-veloce* flings through Alpine passes will be fully abetted by the grand turismo-influenced stiff structure, independent suspension and electrically-assisted steering. The S and LE Premium trim levels feature alloy wheels wearing the same sized tire as a Ferrari**. The driver confidently maintains control with the assistance of high-tech driver aids — stability control, traction control, ABS — the same type of technologies found in a Maserati Granturismo***. The shapely form was created with input from design studios in Turin****. It's even available in a polished-yet-seductive shade of la Repubblica's national racing color. Crack the Chianti, folks. 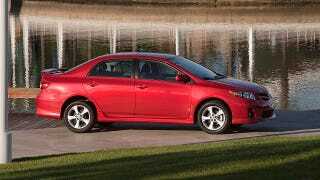 The 2012 Corolla is as Italian as a big bowl of noodles***** and as soulful as Pavarotti******. *: In comparison to a sea turtle or platypus. **: 1986 328GTS, front tire. ***: And pretty much every other vehicle currently sold. ****: So was the Fiat Multipla. *****: The Chinese were eating noodles three thousand years before the founding of Rome.